The Entertainment Capital of the World, Las Vegas is a retirement and family city which attracts travelers from all over the world. Great casinos, amazing shopping centers, fascinating theme parks, an exciting nightlife makes Las Vegas a perfect destinations to spend a short or long holiday. The travelers arriving at McCarrain International Airport can either use the bus service or rent a car to reach the city centre. Las Vegas has an efficient public transportation system but the easiest and the most cost-effective way of traveling within the city is in a hired car. RTC Transit, a public transportation system offers bus service throughout Las Vegas, North Las Vegas, Henderson and other suburban areas of the valley. The most commonly used means of public transportation in Las Vegas is the Citizens Area Transit (CAT) Bus which has 49 scheduled routes throughout the Las Vegas Valley. The fare for the buses is $1 for kids and seniors and $2 for adults and for all residential routes. For the travelers traveling around the strip the most convenient way option is walking as mostly all the hotels and casinos are located very close to each other. The travelers can also choose to travel with the new and ultramodern Las Vegas Monorail. 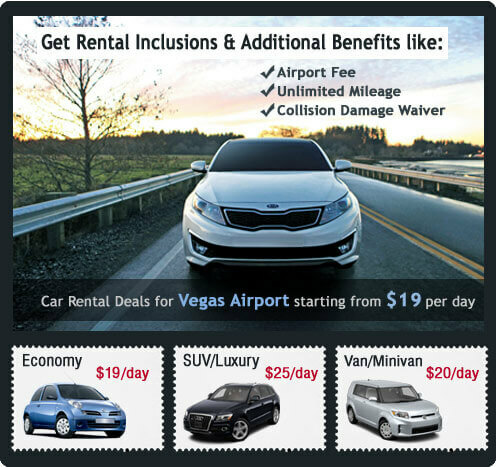 Vegas Airport Car Rental is a renowned car hiring company having rental locations throughout the city. At Vegas Airport Car Rental the travelers can have the best car hire experience. Vegas Airport Car Rental a wide range of new vehicles which suits the needs and budget of all the travelers. The travelers can book the cars in advance on phone or online and pick them from the chosen rental location. Vegas Airport Cars Rental offers the travelers with special discounted car hire packages in which they can avail luxurious car hire service at the most nominal rates.